Southern Winds, Lethbridge’s newest wind ensemble, is made up of professional musicians from Southern Alberta and based in Lethbridge. The ensemble will perform their inaugural concert in May 2018, featuring monumental works that span generations, from military band beginnings to modern musical grandeur. The musicians for the ensemble are drawn the many stellar musicians from the Lethbridge region, but also Medicine Hat, Calgary, Edmonton, and Victoria. The professional musicians perform with a number of local ensembles and perform frequently in the region. 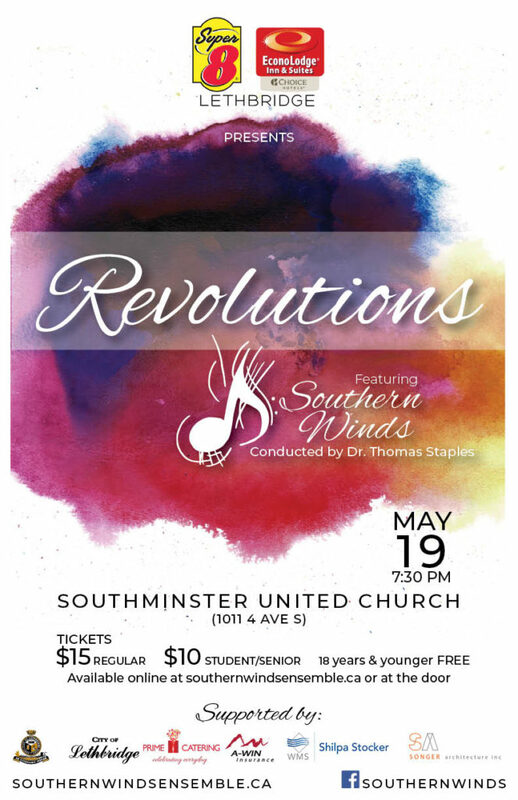 Join Southern Winds, Lethbridge’s newest wind ensemble, for a performance of monumental works for wind band that span generations. Made up of accomplished musicians from Southern Alberta, Edmonton, and Victoria, Southern Winds is sure to capture your musical attention! Conducted by Dr. Thomas Staples, come and enjoy music that reflects early band and folk traditions, brings revolutionary history alive, and showcases the scope and grandeur of modern music for wind ensemble.